Despite the fact that it wasn’t really snowing today…Allen decreed that it was a snow day and we were just going to relax. (I did do the dishes though). So I got out my books of floss and my JCS ornament magazines and went hunting for something to work on for the 24 hour challenge on the Friends Gather BB. 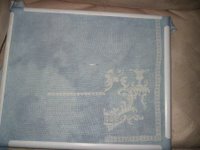 I finally decided on Woodland Snowfall by Little House Needleworks from 2003. I am about a third of the way through and hopefully will have a finished pic for tomorrow. Last night I only worked a little bit on my Butterfly Night. 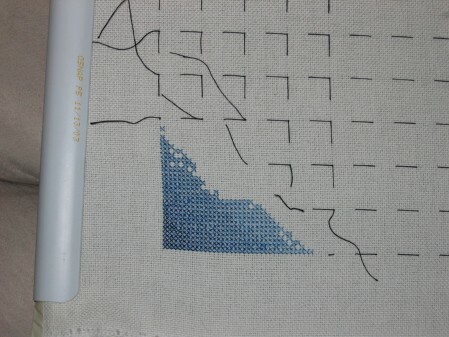 I progressed a little bit more on the big blue triangle of doom. 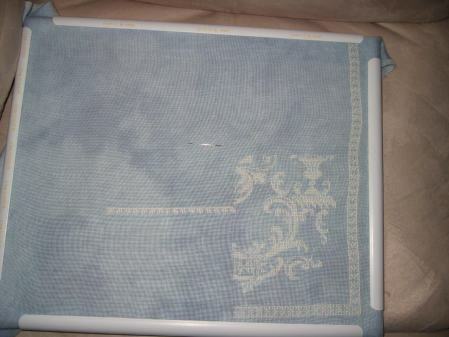 It is a lot less intimidating than when I stitched the companion piece. 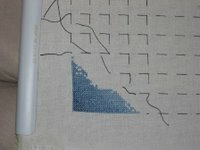 I am hoping to finish this triangle next Friday night. How many books do you usually take with you on vacation? Too many? Too few? Do you still have room to pack clothes? I usually take too many books when I go on vacation, but I would rather be safe than sorry. Especially if I am going somewhere where I might not find a bookstore. I love to read on the beach (our primary vacation choice) so I need to have plenty. Do you read the same kind of books when you’re on vacation as when you’re at home? For the most part it is the same stuff. I like to know that when I am on vacation I have things I know I will enjoy so I tend to bring authors I know.